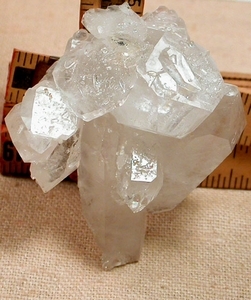 This clustered 'bouquet' of doubly-terminated Arkansas crystals includes translucent to veiled to radiantly clear individuals. It's a whole collection of tabular, 'arkimer', penetrated, glitter, rainbow, multi-terminated, record keeper and twins. 1-1/4x 2-1/4x 2-3/4" tall, there is a rare iris at the base of the 'stem' crystal. The neat rounded shape is a pleasure to hold, or to add to your cabinet sized cluster display.